The scoop on this all-important technique for literally holding your partner’s life in your hands, from the gym to real rock. Belaying, or holding the rope to catch any fall by your partner, is the ultimate acceptance of trust: You and your partner literally place your lives in each other’s hands. 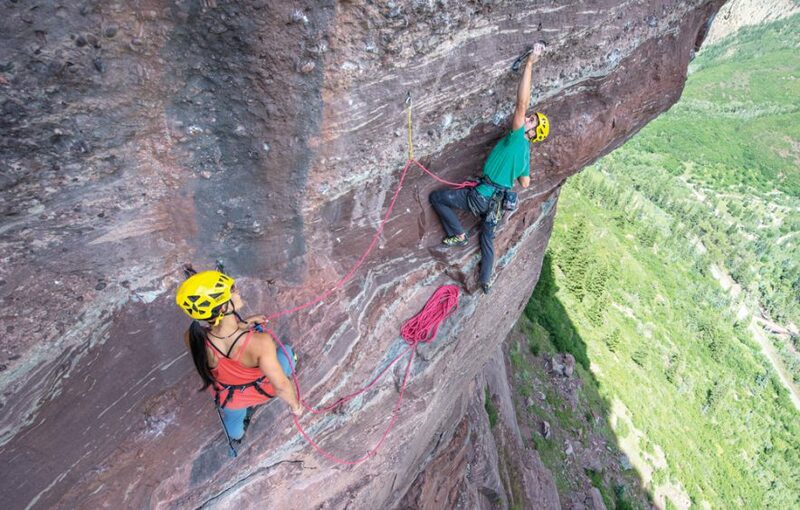 “Belay” is the most important word in the climbing lexicon. Belaying, or holding the rope to catch any fall by your partner, is the ultimate acceptance of trust: You and your partner literally place your lives in each other’s hands. Don’t screw up! In the 1970s, many aspirant climbers underwent a brutally primitive belay test. The student belayer was lashed down, and an instructor dropped a concrete bucket from a tower. The student had to stop the bucket with but a rope around his or her waist and bare (trembling) hands. This old way of teaching certainly proved the immense forces that a fall can generate and the necessity for diligence. Although today many climbers learn belaying in the gym, often using brake-assisted mechanical devices, belaying will always be vulnerable to human error. Gyms and crags are quickly getting busier, and attention suffers as traffic increases. Even in a crowd, you must concentrate on your climber. Do not be distracted by the climber who strolls along and asks you for beta or how your summer is going—don’t talk to anyone when you are belaying. Likewise, avoid starting a conversation with someone who is belaying, and walk well around the person so you don’t compromise her belay. 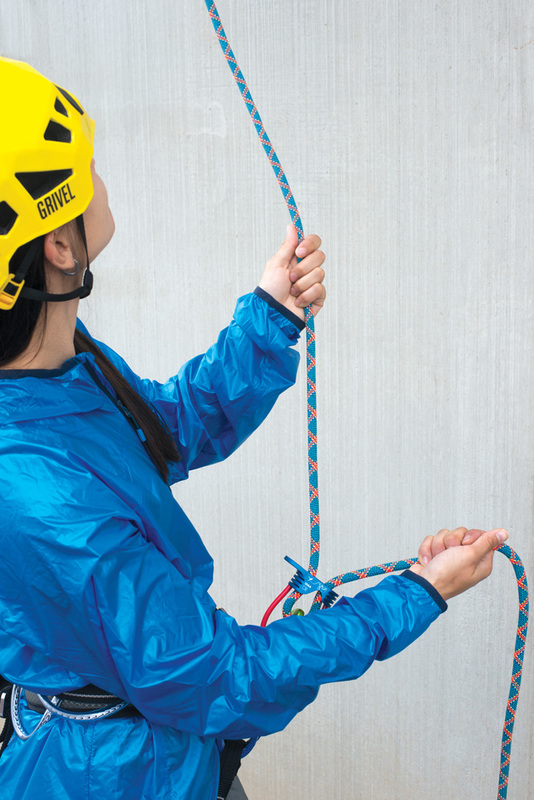 Belay devices fall into two categories: assisted-braking devices and non- assisted braking devices. The latter, whether one is a “tube” or some other variation, all basically work the same. Essentially, you feed a bight of rope into a slot that is secured to your harness with a locking carabiner. These non-assisted devices crimp on the rope when the climber weights it, creating enough friction for the belayer to catch or hold the climber. An assisted-braking device has a mechanism that clamps or squeezes the rope when it is under tension. The assist feature requires minimal use of hand strength, but these types of belay devices still require two hands—they aren’t hands-free! 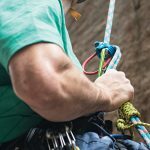 Follow your device’s instructions for properly loading the rope, securing the device and rope to your harness, and the device’s specific techniques for belaying and lowering. While most devices work similarly, they don’t work exactly the same, and it is beyond the scope of any manual to tell you how every design should be used. Review the instructions, and take a belay class at the gym. And don’t be surprised if the technique one gym teaches is different from how another gym will have you belay. More and more, though, gyms are teaching the PBUS method of belaying (see photo, left). P = Pull. B = Brake. U = Under. S = Slide. This technique essentially keeps your brake hand in the braking position so if the climber falls, the belay device engages without the belayer having to make a change in hand position. GOOD! The PBUS method of belaying keeps the brake hand in the brake position at all times. The brake hand always stays below the belay device. DANGER! The old “slip and slide” method of belaying holds the belay device open. If the climber falls, the rope could slip through. 1) Double-check that you’ve locked the belay carabiner and that the carabiner isn’t crossloaded: that the rope or belay loop isn’t loading on the carabiner gate or spine. 2) Make sure your device is compatible with the diameter of your climbing rope—not all belay devices grip on every rope diameter. 3) When a belayer feeds out or takes in rope through the device, the guide hand operates the rope on the climber (unweighted) side of the device, and the brake hand holds the rope on the other side and locks down to catch any fall. 4) The guide hand will often let go of the rope, but the brake hand NEVER LETS GO OF THE ROPE and, just as important, the brake hand is always in a position to apply a braking action. 5) Have the climber check that you’ve loaded the belay device correctly and your harness is buckled right. Also check the tie-in knot. 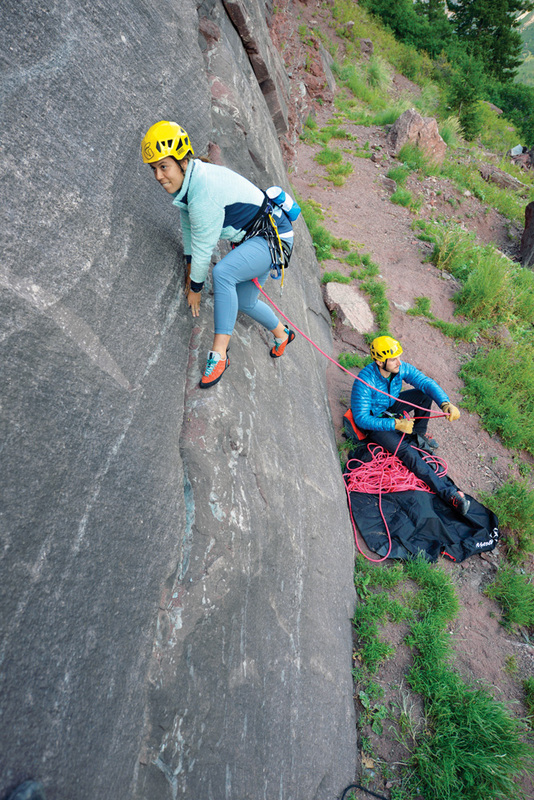 7) Develop a mental belay checklist, and tick every box every time you belay. 8) Knot the end of the rope so the climber can’t be dropped because the belayer ran out of rope. 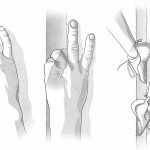 It is imperative that the climber and belayer iron out communication, so both understand what the other means—miscommunication is a leading cause of injury, even death. The following commands are universal. Double-check that your partner understands them. This means that the belayer is paying attention and is ready to feed out rope, reel in slack, and catch the leader. The climber then visually confirms that the belayer indeed has her on belay. Only then should she begin climbing. This means the climber needs the belayer to reel in any slack and hold her on the rope. 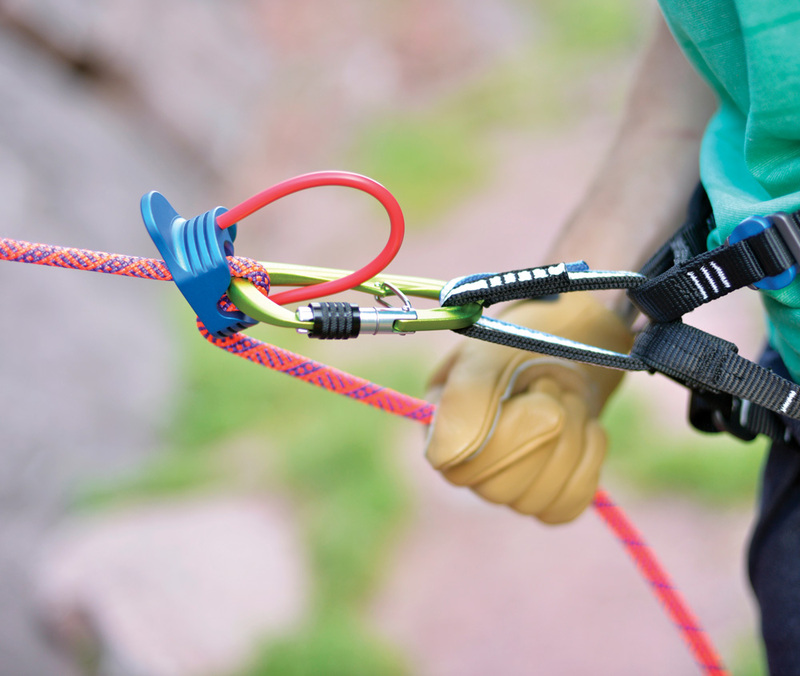 The take command can be used on a route, so the climber can rest, or at the end of the route, when the climber is ready to thread the anchor or lower. Climber only says this when she is either on the ground or safely anchored at the upper station/belay. GOOD! The PBUS method in action, holding a climber on a locked-off device. Note the belay glove. This means the climber could fall. This reassures the climber that the belayer is ready to catch a fall. Means the climber needs the belayer to pay out a bit more rope. This heads-up for the belayer means the climber is about to clip a piece of protection and needs slack to do so. A warning that the climber has dislodged a rock or dropped a piece of gear. Belayer should take cover—and still keep a firm grip on the brake side of the rope. Climber is about to fall or is falling. When you start belaying at the gym, stick with toprope routes until you progress to catching lead falls. When you go outside, know that blinding sunlight, uneven ground, and wind can complicate belaying. Inside and out, belay gloves let you lower your partner without getting a friction burn, plus they prevent the dirty rope from gunking up your hands. And wear a helmet. Falling rocks or dropped gear could bean you on the head. Communication between the belayer and climber is paramount, but you’ll see even experienced climbers become careless with belay commands. Learn and use them always. You won’t always be able to see or hear your partner, so belt out the signals, and don’t climb or take someone off belay until you know you’re on or he’s off. When in doubt, wait and keep yelling. Never take someone off until you are sure. Develop a signaling system for situations where you can’t hear one another. When you are leading, once you are safely anchored, give three sharp tugs on the rope to signal you are off belay (while also shouting the words). When belaying, tug back three times to show comprehension. When the leader is ready to belay, again give three tugs. The second should give three affirmative tugs back before unplugging the belay and climbing. Catching falls outdoors is more difficult than belaying in the gym. Uneven terrain beneath the route, falling rocks, glare from the sun, dogs, children, bugs, wind and weather are potential complications. Start belaying solely on toprope, and progress to catching a leader only after you are absolutely confident in your abilities. When you belay a lead climber, initially spot him or her as you would a boulderer, until he clips into the first piece of protection. After that, leave a slight bend of slack in the rope until he’s ready to clip the next bolt or gear. When the leader reaches down to pull rope for a clip, pay out enough slack so the rope doesn’t come taut, then reel in the excess slack once the leader has clipped the pro. Be especially attentive during the clipping process—the extra bit of rope you pay out makes the leader vulnerable to a longer fall if she blows the clip. Bottom line: Catch your climber. Keep him off the deck. The second basic precept is to keep the slack to a minimum to reduce the fall length, while still ensuring the climber’s ease of movement. In some situations, such as when a climber is seconding just above the deck, tighten up your belay. Finally, notify your climber if he or she is doing something dangerous. For example, if a leader’s rope is behind one of her legs or hooked around a foot, tell her so she doesn’t flip upside-down if she falls. The belayer is standing and facing the climber. This attentive posture has the belayer prepared for any scenario: He could catch a falling climber, dispense or reel in slack, and dodge dropped gear or a dislodged rock. The belayer is sitting and facing away from the climber. This inattentive posture could allow the climber to hit the ground, and if the climber falls, the belayer could be dragged or slammed into the rock, possibly also losing control of the belay. This belayer got launched into the wall by the falling climber. Good thing she’s wearing a helmet! Whether the belayer should be anchored on a ground belay is a matter of judgment. 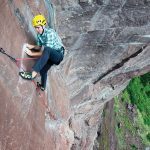 If he might be pulled off a belay platform or slammed up and into the underside of an overhang, he may want to anchor the belayer to the ground. The Climbing Wall Association recommends that the belayer be free to move around and adjust his position as needed, and that the belayer should only anchor to the ground/floor if the climber drastically outweighs him. At sport crags these days you’ll seldom see the belayer anchored, and mobility can indeed be useful. When the leader is beginning a pitch, the belayer can help by holding the rope away from the wall and by positioning himself so the rope is available for easy clipping. A mobile belayer can also, by quickly stepping forward, provide slack for that desperate clip. In general, stand close to the wall and directly under the first piece of gear—this will prevent you from being dragged or slammed into the cliff when the climber falls. A climber standing 15 feet from the base of a climb, seeking shade but not thinking to tie into the tree, can be dragged through trees and thorns if her partner falls. Keep a constant eye on the leader, for his or her safety and your own. Once you have the basics of belaying down pat, you’re ready to learn how to belay with a softer touch. Be advised that this is an advanced technique—only practice it once you have mastered belaying. 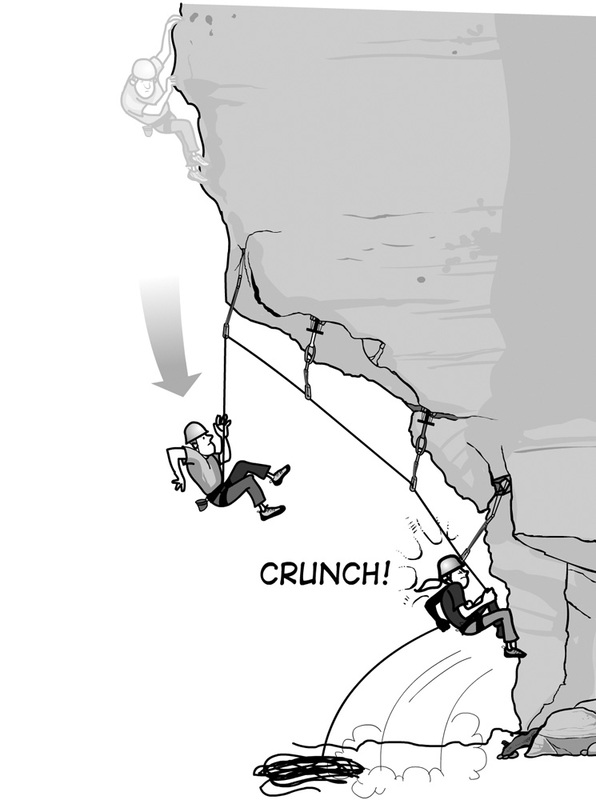 On steep sport routes, a “soft catch” is a common technique for helping the leader avoid an injury due to being slammed into the rock when the rope abruptly snaps taut. Some gyms will have floor anchors and require that the belayer secure himself to these. Other gyms will prefer that the belayer isn’t anchored. If you want to belay in a gym, you have to follow the rules. 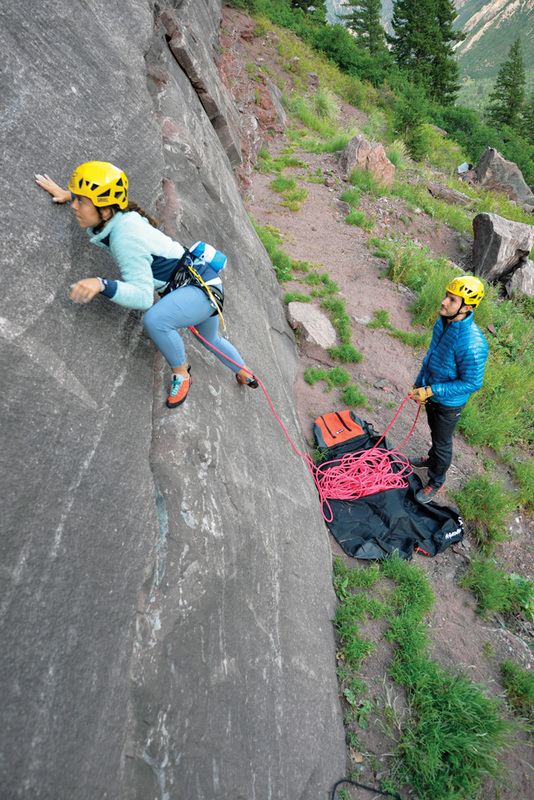 If the belayer weighs less than the climber, a fall usually lifts the belayer into the air, automatically resulting in a gentler catch for the climber. However, if the climber outweighs the belayer by a large amount, a fall can launch the belayer like a rocket, which is unsafe for both the climber and the belayer—beware! To soften a fall, belay with your knees bent and straighten them during a catch, or even take a small hop just as the rope begins to pull taut. Never sit while belaying. Sitting belayers can be dragged into ground obstacles, possibly causing them to lose control of the belay. Using a new, dynamic rope, as opposed to a worn, stretched-out one, also helps ensure a soft catch. 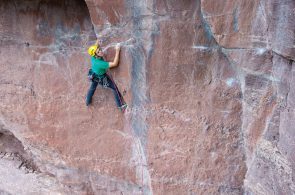 Sport climbing and the ground belay often involve lowering the climber, another scenario that is ripe for human error. Before the climber leaves the ground she must let the belayer know whether he plans to rappel or lower. The belayer NEVER takes a climber off belay unless he is certain the climber is safely anchored; shout for repetition. If, as the belayer, you are uncertain whether your leader is to lower or rappel, keep her on belay until the curses for slack are loud and clear. DEATH AND SERIOUS INJURY HAPPEN EACH YEAR WHEN THE BELAYER MISTAKENLY TAKES THE CLIMBER OFF BELAY! Due to the “pulley effect,” the load on an anchor doubles when a climber is lowered. At modern two-bolt stations this isn’t usually a big deal, but when you are lowering off gear you may want to rappel instead. Rappelling eliminates the pulley effect—only the climber’s actual weight is placed on the anchor. 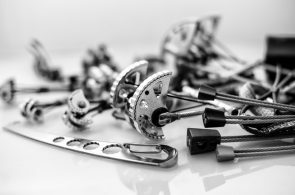 Most anchors at popular areas will be fixed with chain and permanent carabiners, which the leader can simply clip and lower. If a climber intends to be lowered, don’t undo the belay at all, but simply wait for the signal to lower. The climber should ask, “Got me?” and not move until he hears, “Yes.” Once the climber’s weight is fully on the belay device, the belayer should yell, “Lowering,” so it is no surprise to the climber to move downward. As you lower the climber, keep a keen eye on the end of the rope. Make sure your rope is long enough to reach the ground. Climbers die and are seriously injured every year when lowered on ropes that are too short to reach the ground. ALWAYS TIE A KNOT IN THE LOOSE END OF THE ROPE. If the rope is too short or your attention wanders, the knot will jam in your belay device, saving the day. Do this regardless of whether you think the rope is long enough for the route. Even experienced climbers have made the mistake of losing a rope end through a belay device, resulting in ground falls for their partners. Watch the end of the rope every minute. To lower a climber, you can feed rope through your belay device or simply let it slide through, holding on loosely with your brake hand. Do this slowly and steadily. Account for protrusions in the rock, and give your partner plenty of time to kick herself away from the wall when lowering past obstacles such as roofs. If she is cleaning gear from the route, anticipate where she will need to pause to remove the pro. Most of the burden is on the climber, since he will have to anchor, thread the rope, rig the rappel and rappel. However, the belayer’s job is still crucial—a screwup could be disastrous. Critically, the belayer has to be certain that the climber is safely anchored, and only then can the belayer take the climber off belay. As the belayer, your job is to verbally and visually confirm that the climber is indeed off belay. Once the climber is off belay, your job is over, but you should still watch to see that the rope ends reach the ground and the rope is free of kinks and knots. A climber at a lowering anchor should confirm that the belayer is ready to hold him. This quick visual check, a double-check to the verbal command of “Take,” can prevent accidents. 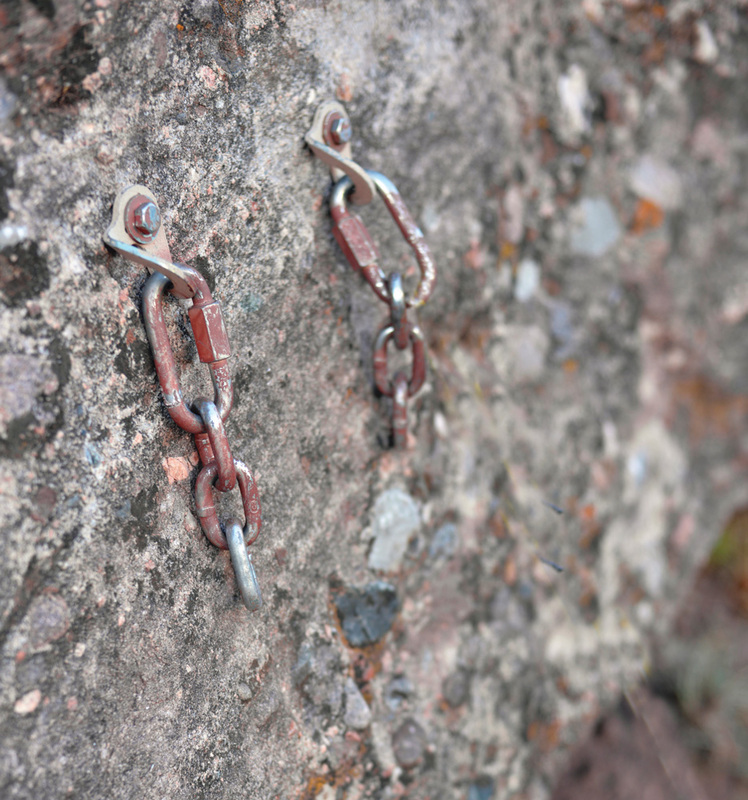 The anchor in this photo is typical of one you’ll find on a sport climb: It is fixed with chains and carabiners (which are usually steel for extra-long wear). At such an anchor, the leader only has to clip both carabiners. Once a climbing team is off the ground on a multipitch route, the belayer must always be secured to a bombproof anchor. After the belay is set up, the leader should clip into the highest point of the anchor. Then, if the leader falls right away, this point will take substantial force off the belayer, and lower the “fall factor,” or severity of the fall. The worst-case scenario is for the leader to fall directly onto the belayer, but any fall near the belay can be harsh because, with only a short length of rope in play, there isn’t much springy rope to stretch and absorb the impact. In fact, a short fall close to the belay puts much more impact on the anchor and belayer than a long fall 100 feet up a pitch, where the elasticity of the rope absorbs much of the force. On a multipitch route, as a leader leads up from a belay and clips into protection, the force on the belayer changes from a downward to an upward pull. Always set a multidirectional belay by placing at least one solid piece to protect against an upward yank (see the “Anchors” chapter). The piece keeps the belayer from getting lifted and protects the anchor from dislodging. Bolts are inherently multidirectional, and ideal if you have them and they are solid. On multipitch routes, to lessen the fall factor (in addition to clipping the lead rope to the belay), the leader should place a piece of protection as soon as possible after leaving the belay. Don’t be cocky; even on easy terrain, you could pop off. 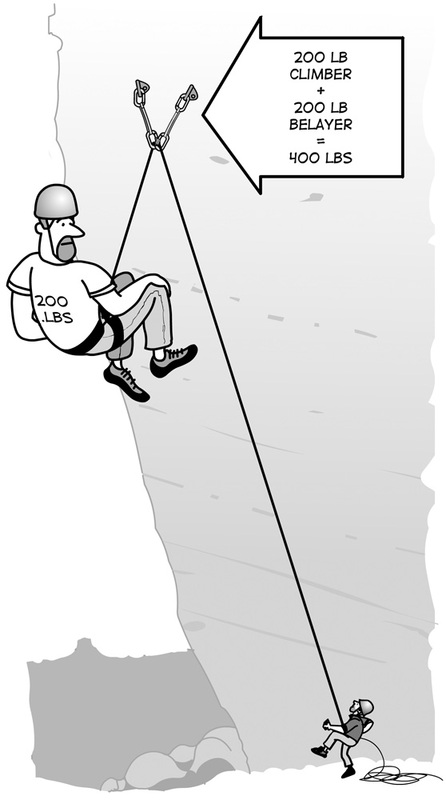 If the leader falls from 10 feet above the belay, he’ll gain momentum for 20-plus feet before you catch him. Worse, such a fall, with no protection in between, could rip the anchor. A single piece of gear above the belay gives a significant advantage for lessening the forces on the belay anchor and the belayer. Pay close attention to the belayer’s position relative to the climber. On multipitch routes, belays can be hanging (with no ledge, you hang in your harness), sitting or standing. Again, the belayer needs to be stationed in a direct line between the anchor and the climber, and tied in tightly to avoid shock-loading the belay anchor or being jerked off balance. As the belayer, position yourself to absorb as much of the force of the fall as possible. When you’re belaying a person who is climbing up to you, a solid sitting or standing position can hold virtually all the force of a fall, minimizing stress on the anchor. This anchor is only equipped with chains. In this situation, the leader will have to anchor, untie and thread the rope for a rappel. These chains and bolts have been camouflaged for minimal visual impact. You may belay from your belay loop, which you may do for simplicity. Or you can clip the climber’s rope through the belay master point, called a “redirected belay.” A redirected belay takes much of the weight of a falling climber off you, and, if you are below the master point, gives you a mechanical advantage for slightly hoisting a climber who needs help. Or you can clip your belay device to the anchor master point, and let the anchor take the weight of the climber. 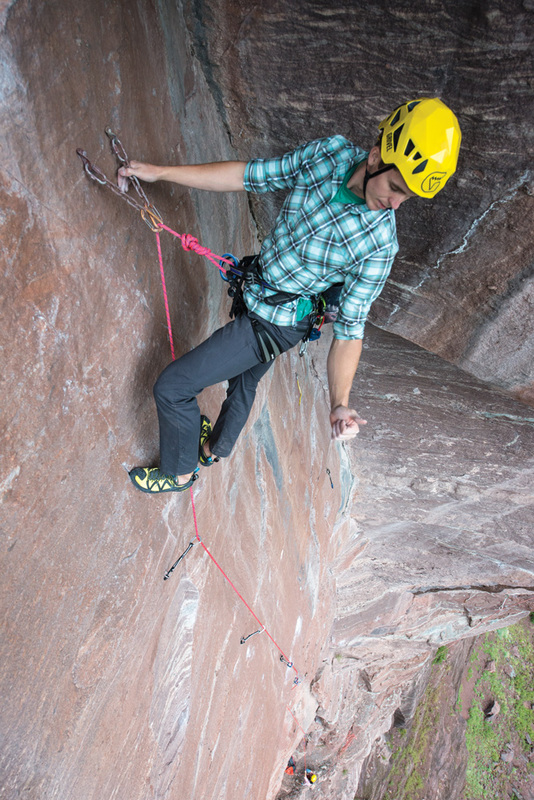 This type of belay is favored by guides, but it requires an absolutely bomber anchor and a special belay device that works in “guide mode.” Some devices work for this, while others don’t. Review the instruction manual. Which of the above methods you choose will depend on personal preference to some degree, but typically the situation will determine how you belay. 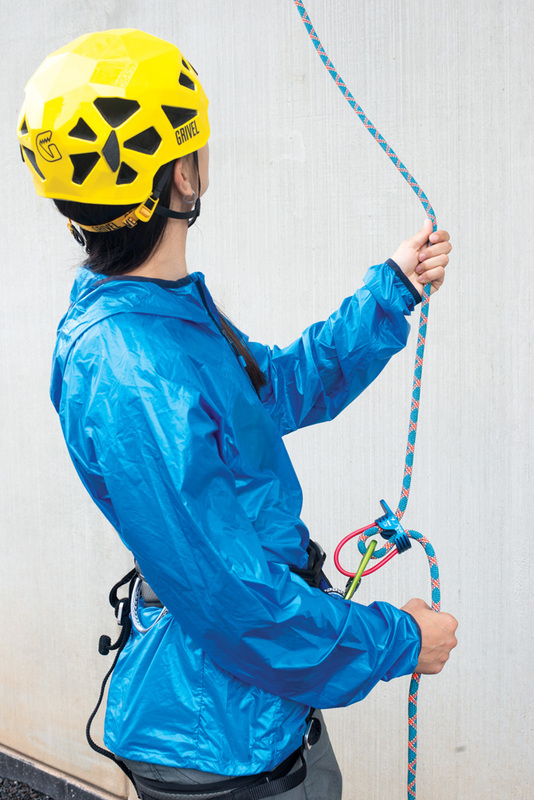 A hanging belay, for example, might be best suited to a redirected belay, while a belay on a ledge might be best suited for the “guide mode” belay. Every gym requires a belay test before you step on the mats. Make it easy for yourself: Take a belay class. The gym’s staff will almost always have courses, which will last two to three hours. Take the class, pass the test, and you’re on your way. Begin belaying on a toprope setup. Many gyms provide belay devices for you. Practice the belay commands until they are instinctual, and make certain you are familiar with your belay device. When you belay, stand where the climber can’t fall onto you, or swing into you. You may need to change your position as the climber moves. Taking your gym’s lead-climbing class is the quickest way to pass the lead test and learn to catch lead falls. After you’re certified, again ask your partner to take unannounced falls—it’s good practice for real situations. Accidents happen in the gym—in 2016, Ashima Shiraishi, one of the world’s top climbers, was dropped 45 feet onto a gym floor due to a belayer mistake. Stay focused. Forgetting to clip into an autobelay in a gym, then climbing to the top completely unbelayed, is a leading cause of autobelay accidents. This sounds like it could never happen to you, but it can happen to anyone. We are all forgetful, or might be momentarily distracted. When you use an autobelay you don’t have a partner to double-check your system. Pay attention! Many gyms have devices that toprope belay you, letting you climb by yourself and knock off numerous routes fast. These “autobelays” use a long cable, piece of webbing or rope, that you clip to the belay/rappel loop on your harness. As you climb, the device reels in the cable, keeping it slightly taut. Fall, and a brake in the device locks the cable, holding you. Autobelays seem like no-brainers, but you need to take precautions, which the gym will discuss with you before you are allowed to climb. • Make sure the cable is clipped with a locking carabiner to your belay/rappel loop and that the carabiner is locked. • Don’t climb so quickly that slack develops in the cable. The cable should always be slightly snug. • Climb as directly under the autobelay device as possible. When you climb off to the side you can take a swinging fall, possibly hitting another climber, a wall feature or a large protruding hold. When you toprope, you climb with the rope strung through overhead anchors. Toproping is an excellent way to learn how to climb because it frees you from hassling with protection while you climb, removes the fear of falling, and allows you to concentrate on simply climbing. At the gym, toprope anchors are bombproof—not so when you venture outside. Climbers are often compla- cent about toproping outdoors. What could possibly happen to you with the rope secured overhead? Well, those anchors could pull. The rope or anchor slings could slice over a sharp edge. You could tie a knot wrong. The list of catastrophes goes on. Prevent those scenarios by treating toprope anchors with the same care you lavish on belay and rappel anchors. At the gym, you’ll be using a “sling- shot” toprope that is already rigged by the gym staff. In a slingshot setup, the belayer stands at the bottom of the route, and the climber ascends from the ground as the rope runs from the climber, up through an overhead anchor, and back down to the belayer. When the climber is finished, the belayer simply has to lower him. 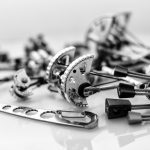 What’s the difference between free climbing, free soloing, sport climbing, traditional climbing, bouldering and aid climbing? Get the “beta” on rock climbing terminology and slang. Glossary of common rock climbing terms.